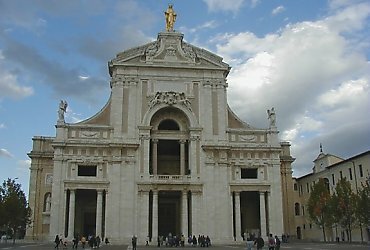 Built on a grandiose scale, the Basilica di Santa Maria degli Angeli is the seventh largest Christian church. Its magnificence may be at odds with the simplicity preached by St Francis himself but the flocks of pilgrims coming to visit the primitive Porziuncola chapel and the Cappella del Transito called for a building that was able to accomodate the faithful. The Porziuncola chapel was given to St Francis by the Benedictines, and is important because it was the initial nucleus from which the Franciscan order was born. The Cappella del Transito is the place where the saint died on October 4th 1226. Work started on the building of the basilica under Pope Pius IV in 1569, to designs by Galeazzo Alessi. Building continued until 1667 however, when the dome completed the initial structure. The bell tower was not added until 1684 and was originally intended to have a twin tower that was never completed. In 1832 an earthquake caused the collapse of the central nave and part of the lateral nave. The facade was originally remodelled in the neo-Classical style, until 1928 when it was again re-designed in neo-Baroque style. The Fontana dei Pellegrini on the left hand exterior wall of the basilica counts 26 water spouts and was a gift of the Medicis in Florence, donated in 1610. The interior of the basilica is divided into three naves, with a series of side chapels. A transept and a long choir with a semi-circular apse closes in the basilica at the far end. Directly under the dome of the basilica stands the Porziuncola chapel (10th-11th century). The exterior of the chapel is decorated with 14th and 15th century frescoes by Andrea d‘Assisi, known as l‘Ingegno). A gothic tabernacle surmounts the roof of the chapel and was renovated after the 1832 earthquake. The vaulted interior contains an ancona by Ilario da Viterbo (1393) depicting the Awarding of Forgiveness. Access to the Cappella del Transito is from the presbyterium. It contains the cell where St Francis died. The exterior has frescoes by Domenico Bruschi (1889), while the interior was decorated by Spagna (~1520). The statue of St Francis near the altar is by Andrea della Robbia, who also completed the enamelled terracotta altar back in the crypt. The basilica is flanked by the il Thornless Rose Garden and the Cappella del Roseto, made up of three rooms. The first chamber was added by order of San Bernardino of Siena, while San Bonaventura gave orders to build the second. They are frescoed by Tiberio d‘Assisi (1505-16), who has mirrored the theme used in the decoration of San Fortunato, at Montefalco. The Museo della Basilica is in another section of the convent. Among the most important works kept here are the "Crucifix“ painted on wood by Giunta Pisano (1236-40) and the "San Francesco“ panel painted by the Maestro di San Francesco in the second half of the 13th century.